Your eyes are in for a treat! 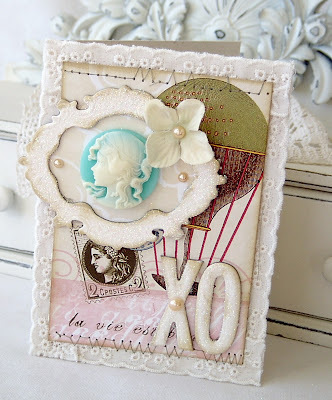 Today's guest designer is the ever so talented Melissa Phillips. 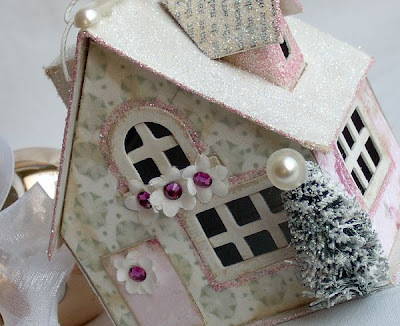 The first time I saw Melissa's blog I couldn't sleep for a week with layers and glitter in my head! 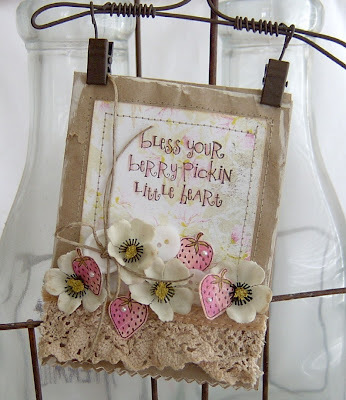 Melissa designs for Melissa Frances, Papertrey Ink, & Heartwarming Vintage. 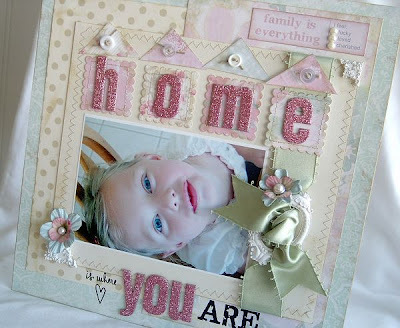 She also designs kits for The Scrappy Gourmet & Frost it Pink and Emma's Paperie, an online store. I always struggle to define my own style….I know what it’s not though….it’s not clean, not simple, not graphic, and not bright and playful. I seem to continually to pile on the things I love, focus on soft colors, distress every inch of what I’m creating, and usually finish off with glitter…sometimes a little, sometimes a lot. 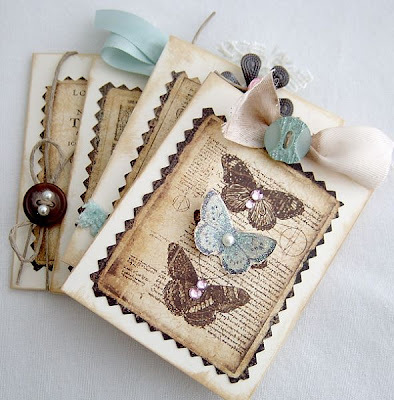 I am drawn to the shabby, vintage side of crafting…it warms me through and through and even though I’ve tried hard to stray from it and create something just a bit funky and ever so trendy…it is transformed back into the shabby style I adore. What makes your style your own? I suppose my trademark touches or things that I notice consistently throughout my work are machine stitching, book print, sheet music, tea-stained trim and twill tape, glitter, buttons tied with hemp, bows, distressed chipboard, acrylic paint, and adhesive pearls or gems….mmmm they’re just like candy to me. I wake up ready to create…fall asleep wishing I didn’t have to sleep and could still be creating…and work on projects throughout the day when I can…creating is a part of me that I have nurtured in myself and it is so rewarding and essential. I am inspired by other artists, by fabric, by other crafts such as quilting and decorating…the colors I see as the sun is setting at night or as the earth comes to life in the spring…inspiration abounds and I search for it and it finds me everywhere. I could never, ever name them all…I continually seek out new artists and love the unique and inspiring styles I find and fall in love with my favorite artists over and over again. I have loved Carolyn Peeler since the beginning. 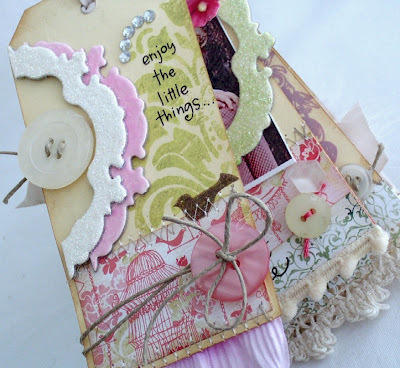 Ranjini Malhorta is always inspiring me to try new things with the same beloved supplies. Roree Rumph's style is very different from my own but I am drawn to it. It’s always filled with detail and perfection. It’s the pot of gold at the end of the rainbow. Teri Anderson is always on the verge of trendsetting and trend spotting. Again, our styles differ, but her creativity has no end. Lastly, a beautiful new discovery, Jill Geraghty-Groves. I don’t think words can adequately describe her artistry. Her work just makes my eyes happy and my fingers itch to create. 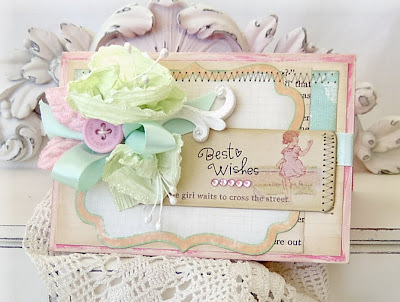 I look around my craft room and I am surrounded in projects in cream, pinks and pale blues….I will always love this color combination first and foremost. I really don’t have a creative process…sometimes it’s just a new product that is sitting and waiting for me to begin working with. 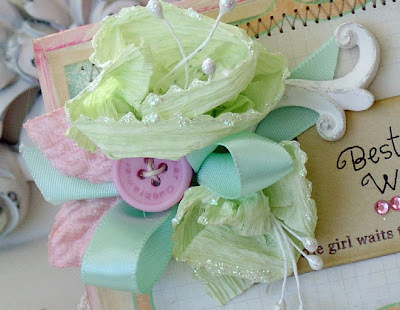 Sometimes I want to string a group of my favorite buttons together and use them as my focal point. A lot of the time, it’s just the way my scraps have been thrown to the side and just seeing the combination of something unlikely together draws me in and it becomes the beginning of something new and beautiful to me. 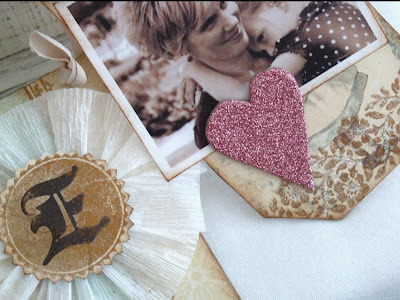 The story behind my little bits of creativity is always the same….the love I feel for others is transpired into a shabby, little card, a mini album about the things that make a happy home, or a page all about my favorite little being. The sweet memories and thoughts that flow through my mind come tumbling out the tips of my fingers and it’s all put together with paper and glue. How can you inspire others to create well? To “create well” you must first allow yourself to create. You deserve to do something for yourself whether it’s spending time outside in your beautiful flower beds with the sun shining on your shoulders; playing the piano or violin to bring beauty to those around you; sharing your delicious home baked goodness with those you love; or creating art for others to enjoy. It’s all so rewarding and part of who we are. Do what you love. I don't know about you, but my head is swimming with inspiration! 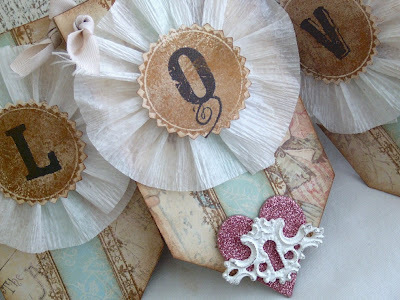 You can follow Melissa and her stunning designs at her blog, Lily Bean's Paperie. Create Well: You deserve to do something for yourself. Do what you love. I found this blog via Melissa's.. 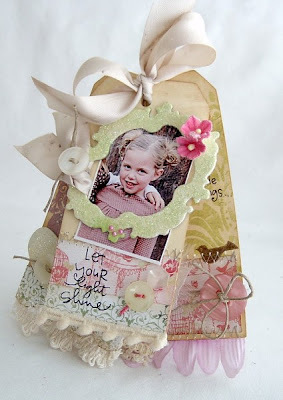 So great and inspiring.. Really love it.. Mellisa is such a great inspiration and she really inspires people to create..